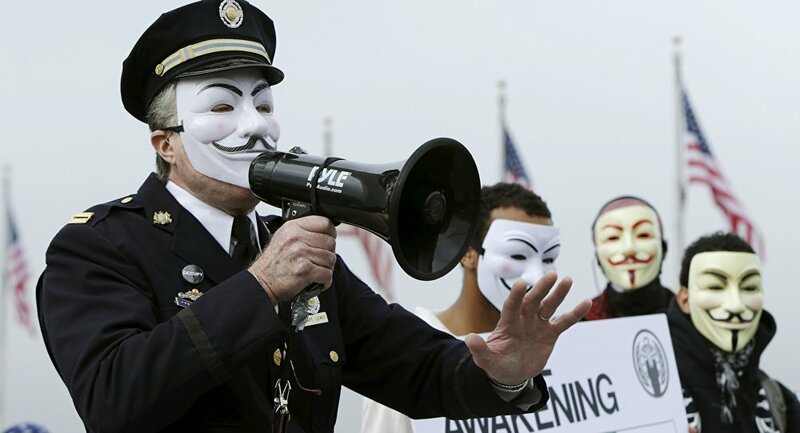 On November 5, protesters took to the streets globally for the annual “Million Mask March,” protesting privacy, government corruption, police brutality, GMOs and a plethora of other issues. In Washington, DC, which hosted the largest of the demonstrations in the United States, the protest began at 9 AM and was still continuing after 5 PM. The crowd of several hundred shut down the streets, beginning the march at the Washington Monument and heading to the White House. From there, the crowd took to the streets once again, stopping a couple of times to flood homeless members of the DC community with cash, food, and hugs. As the group arrived at the Environmental Protection Agency, they began banging on windows and doors, breaking one. At the Capitol, the group was met with police, although there were no altercations or incidents. At Monsanto headquarters, the crowd took down the American flag and raised an Anonymous skull and crossbones flags. Many screamed at the guards about the dangers of GMOs — while smoking cigarettes. As the crowd marched back to the White House, several protesters used either spray paint or spray chalk to leave (sometimes misspelled) messages in the roads. As of 5 PM there had not been any arrests.